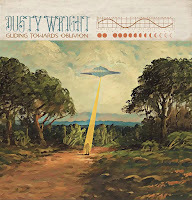 Dusty Wright is a self-described metaphysical cowboy based in New York City. His new album, Gliding Towards Oblivion, is the third installment in a trilogy of ruminations on life, death, and love that started with If We Never... (2011) and Caterwauling Towards The Light (2017). In the title track, the finger-picked acoustic guitar may remind you of Donovan; and you wouldn't be far off. Not only did Donovan teach that method of guitar playing to John Lennon and Paul McCartney while they were all in India, but it was also the basis for many of the songs on the double album The Beatles (aka The White Album). In addition, Donovan joins Wright and provides backing vocals on a cover of "Mellow Yellow," Gliding Towards Oblivion's bonus track. Wright's thoughts about life and death are very much present in this song. He contrasts the teachings of two religions as we glide towards the end: "Jesus said, 'Repent your sins' / Buddha said, 'Life begins again.'" The melancholy feeling of facing what we all know is coming eventually is heightened by the addition of Matt Goeke's wonderful cello playing. On "Man In The Mirror," Wright channels the songwriting and vocal stylings of Harry Chapin. The song also brings to mind the lonely man who has lost someone much as the character in McCartney's "For No One," a man, as "Man In The Mirror" points out, "knew all along alone he would die." "When she left she left him cold," Wright sings, "No fanfare, nothing he could hold / She damned his soul forever." Despite the downbeat lyric, the song is an upbeat tune musically with some terrific Flamenco-like guitar playing. The sad and beautiful "Fade Away" has a friend telling this lost soul that it's his fault the relationship is over, and it's time to move on if he can: "You let your love fade / But it left you filled with pain / You let your love / Fade away." And that sad cello is heard again. The bluesy dreamy, and Dylanesque "Rhythm Of Dreams" could certainly have found a place on that songwriter's late-period work, especially Time Out Of Mind. But unlike John Lennon's invitation to take the leap into a drug-induced state ("Turn off your mind / Relax and float downstream"), Wright instead suggests, "When night swallows day / And magic's at play / Let your spirit stray / Into the rhythm of dreams." "Cicada" brings back the Buddhist teaching from the title song: "I want to shed my skin / And start again." In fact, Wright arranged the tracks so the album had two distinct sides -- as a vinyl listening experience -- with the overall theme framed by the first and last tracks. Gliding Towards Oblivion is out now on PetRock Records.